If for any reason you are not satisfied with your purchase you may return the item in its original condition with the receipt, within 7 days of the purchase date for a full refund or exchange. After the 7 day period and up to 30 days from the purchase date, the item may be exchanged with the receipt, or a store credit may be issued. All returns or exchanges must be approved by management and may be subject to a 25% restocking fee. Watch repairs require a NON-REFUNDABLE deposit of $25.00. This deposit may be applied to any work done to the watch. Any Cleaning, Oiling and Adjustment (COA) or replacement of watch movement has a 6 month warranty on the movement of the watch. Special conditions apply for watches sent to the factory. Battery replacement: Hannon Jewelers is not responsible for water resistant watches after battery change if we do not perform a water test. All special orders of merchandise, either by placing an order to a vendor or by manufacturing a piece of jewelry by a customer request, will require a non-refundable 50% deposit. In some cases, it will require a full payment at the time of placing the order. There are no returns or exchanges for custom made pieces, special orders, engraved items, stock items altered at the customer’s request and items that have been altered in any way. At any time our customers may have with the opportunity to upgrade the Hannon diamond for one of greater worth. We will issue full credit for your original diamond with proof of purchase and verification of original quality, condition and personal ownership. The price for the new diamond must be at least fifty percent higher than the price of the original stone. All original laboratory certifications are required. This policy does not apply to mountings. We provide our promise of value to you in writing with our Statement of Replacement Value Report for insurance purposes. This complementary Document includes detailed information about your jewelry including any gemstone and diamond and can be used for acquiring insurance coverage. For diamond engagement rings, we will issue complementary updates for this report for the first 10 years. For as long as you own your jewelry from Hannon, we will provide a complementary cleaning and inspection of your jewelry on regular basis. We recommend to our customers to bring us your pieces at least twice per year for this free service. This does not include the cost of any repairs needed. Protection of your valuables in our custody. To repair, design or appraise your jewelry, Hannon Jewelers would need to have custody of your valuables for a time. The protocol we follow is that we take detailed account of each item, including photographs at the time of take-in. Because of the nature of jewelry, we cannot be responsible for the actual or full identification and/or condition of jewelry at the time of receipt. Cleaning and close inspection of jewelry may reveal additional inclusion or damages not seen at the time of take-in. We can provide identification of gemstones and jewelry by appointment only. See our page for appraisal services for fees and conditions. Our own insurance policy would require you freely disclose to us the value of each item in order that we may offer financial protection in case of loss. Hannon Jewelers or any of our employees will not evaluate your jewelry for this purpose at that moment. We can only offer guidance of values of similar products to you. 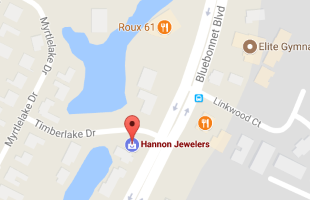 Hannon Jewelers is not responsible for items left over 60 days. In case of loss, damage or theft of your jewelry while in our possession, replacement value will not exceed your own the declared value of the item. We reserve the right to replace your jewelry with other merchandise of similar use, quality and value. We reserve the right, at our discretion, to change this policy at any time. If we change our store policy, we would post those changes on this page so that you are aware.